Existing misconceptions around server technology have misled business and IT executives into believing Linux on x86 platforms is inexpensive and easy to implement, with Intel servers running VMware seen as the lower-cost option for processor environments. These misguided beliefs have resulted in higher data center costs and sub-optimization for mid-market and larger companies. IBM LinuxONE servers are effective in-house Linux cloud server platforms that counter these myths and can provide IT executives with an alternative Linux infrastructure solution that will help organizations contain costs, become more competitive, and assist with a transformation to a least-cost consumption-based usage model. 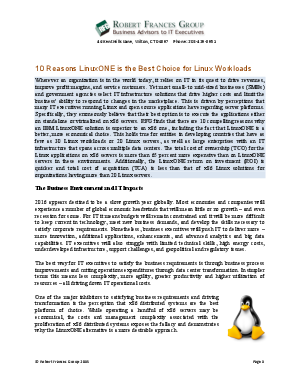 Download this ebooklet to find out more on how LinuxONE solution is superior to an x86 one, including the fact that LinuxONE is a better, more economical choice.